(Updated Apr 2019) – Whether you are a professional chef, or a culinary enthusiast who loves experimenting in the kitchen, a sharp, easy to use, versatile and good quality knife, is a must have. Instead of having a set of garbage knives – spend your money on one decent all purpose knife. If you are looking for a knife that can effectively handle all your chopping, slicing and cutting needs, then this beautiful piece of cutlery from Shun is the right choice for you. Those who have used this knife say that they got so used to it that they could never do without it again. It also looks awesome. Looks apart, this knife is wickedly sharp and capable of slicing it’s way through pretty much anything in your kitchen. This top quality multi-purpose knife ranks amongst the best knives available on the market in terms of both aesthetic appeal and functionality. It is made of several layers of soft stainless steel, and has a solid carbon steel core. So, you get a knife that is extremely strong and has razor like sharpness. It gives you a neat cut, and due to the damascus style blade food will not stick (not even moist food). The wooden D-shaped handle is ergonomically designed to offer a firm, comfortable grip. With the Shun premier chef’s knife, you will be looking forward to getting out a chopping board and cutting onions or anything else you can get your hands on. Super sharp: The blade core of this Shun knife features high carbon VG-10 Japanese steel which combined with the double bevelled edge gives this knife extra ordinary sharpness. 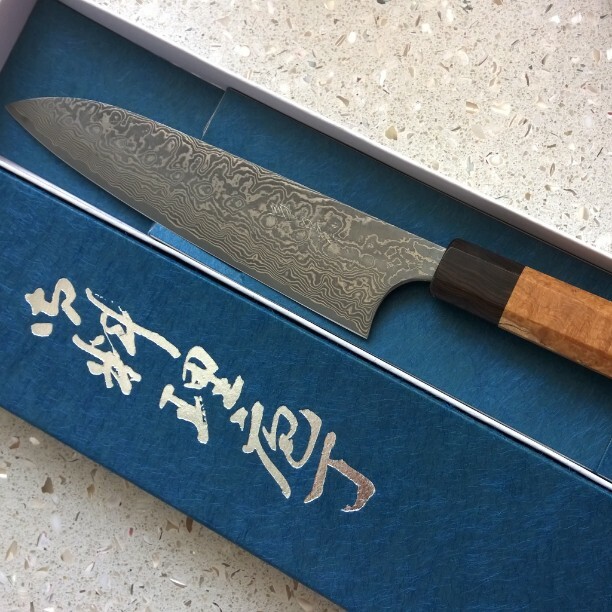 The blade of this Shun 8 inch chef knife is clad with 16 layers of SUS410/SUS431 pattern Damascus steel on each side of the knife for super strength. The blade also has a 16 degree angle which is a higher incline than European knives. With regular honing, you practically have a samurai sword. Light weight and balanced: If you have to spend hours doing prep then this knife makes your life super easy. It is extremely easy to use and produces swift and smooth cuts. Ergonomic handle: The pakka wood handle is made of hardwood impregnated with strengthening resin. The walnut coloured handle not only looks good, but is easy and comfortable to grip. Looks amazing: The Shun 8 inch chef knife is the perfect classic Japanese knife; the kind you dream about. The hand hammered finish and beautiful pakka wood handle render it an aesthetic touch. Easy and safe to use: Unlike many other Japanese knives, the Shun premier chef’s knife can be easily used by both left handed and right handed people. The wide handle helps keep knuckles off the board. Shun premier chef knife is lightweight, great for slicing things like meat, fish and vegetables, but is a little fragile for performing heavy duty hacking functions. Don’t go cutting through bone with this. Some people complain that debris or food particles get accumulated on the hammered surface, making it slightly difficult to clean. 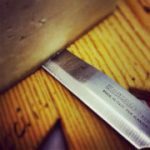 However, this problem is common in all hammered knives. 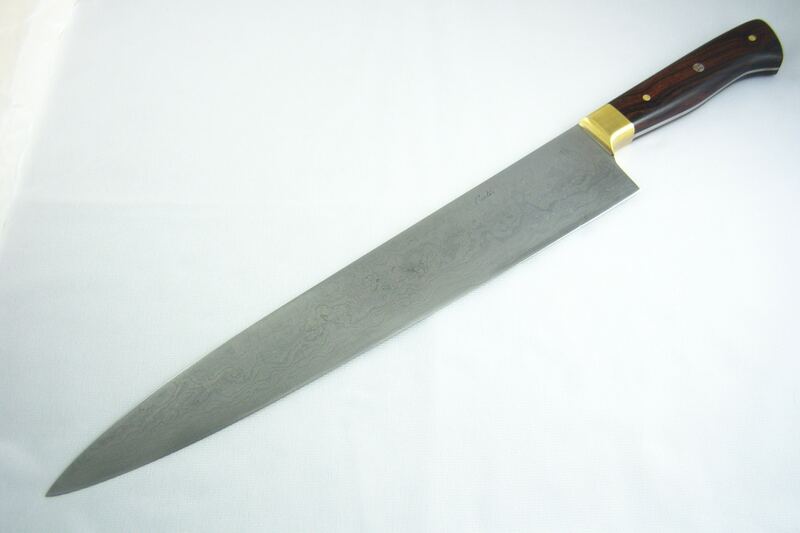 The Shun 8 inch chef choice knife works well for both professional and home use. It fits perfectly in your hand, and lets you do prep work in no time. If you are a looking for a professional grade, multipurpose knife for your home kitchen or for work, then this is it. Final verdict: Is it worth your money? One word. YES. It is so worthy of your money. This knife will not only turn your cooking world upside down it will also last you a lifetime. Check it out on amazon for reviews and deals.